One of the inconveniences I acquired through chemo treatments is neuropathy in my feet and hands. I’m learning to deal with it … slowly. My feet bother me more than my hands. I hear that’s how it normally works. If I could detach my feet and stand them in the corner until they promised to behave, I would. So my husband, bless his heart, does what he can to encourage me and keep me comfortable when we go out. Ride the wheelchair he said. I had a doctor’s appointment at a fairly large hospital. She sent me for blood work at the opposite end of the building. Gene insisted on pushing me in a wheelchair. I protested a little, then took a seat. A humbling experience. When we reached our destination, I admitted he was right. I never could’ve made it on my feet. Use the scooter cart he said. Every time we went to Wal-Mart the past several weeks, Gene suggested I use one of those scooter/carts. I proudly said I’ll be okay, walked half way around, went to the front of the store, found a bench, and sat until he finished the shopping. The last time I went with him, I barely made it to the back of the store. I looked up at him and admitted I couldn’t go any further. Tears welled up in my eyes as we walked to the entrance where I had a lesson in driving a scooter/cart from a sweet lady who had just finished her shopping in one. I buzzed back into the store and swiped the tears from my cheeks as I swallowed that big hunk of humble pie. Again, I had to admit he was right. I was so silly to have tortured myself rather than accept the help available to me. Buy a shower chair he said. We had discussed buying a shower chair for a couple of months because taking a shower exhausted me. My nerves will heal in time. I’m getting stronger. I can take a shower without sitting down. The trouble was I couldn’t. I had to lean on the shower wall to wash. And I struggled to get out of the tub when I finished. One day Gene put on his coat and said he was going to get me a shower chair. That was that. I bit into another slice of humble pie and, like the other times, was thankful I had. I only wished I had listened sooner. My neuropathy keep me from living life the way I used to live it. I eat more humble pie because of it. But it’s not going to stop me from doing what God created me to do. It won’t rob me of my joy. It won’t keep me from loving and being loved. 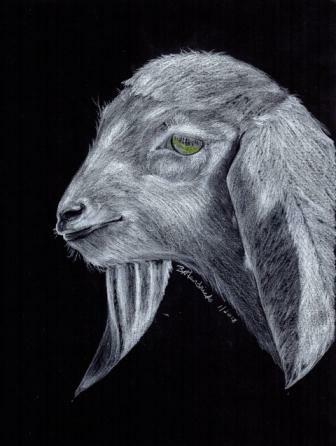 As long as I can draw pictures like the above goat, I know God has a plan for me. How about you? What has caused you to eat a little humble pie lately? Thanks for the encouragement and prayers, Sue. Pride is rather subtle, isn’t it. Hi, Brenda. I didn’t know that it was at this much level of uncomfortable situations. I will keep you in my prayers. Never underestimate the power of the blood of Jesus for healing. Hang on to Jesus promises of healing until they come to pass. Is there any healing seminars nearby where you could pray for you. Blessings, Sana. Last year, while planning Holly’s wedding, I almost let my feelings about her making the choice to live with her boyfriend “steal my joy” of having fun with her. I barely got through the wedding gown shopping, and when it came time to make invitations, I joined her not-my-choice friends and worked on cutting papers, while crying inside. After that experience, the Spirit let me know what I was doing. From then on, though still a struggle, I made myself look at the precious daughter I loved with every part of my being and began to treasure the times with her. The wedding itself was a testament of their love for each other, one where everyone present felt the joy emanating from them both. Then, there’s Faith and her choices from the past year, including staying often (in separate rooms) at the apartment her fiancé and she picked out for their future home together. Once again, because of my desperate need to make her do things my way, fearing confrontation that would push her to make even worse choices, I almost missed my chance. This young woman, who came ten years after her sisters, who has been my confidante and my friend, has become an amazing woman-of-God, as well as quite a gracious and humble hostess in the home her fiancé and she are fixing up for their life together come June. I almost let the enemy “steal my joy” of basking in the love of such an incredible daughter, the one who told me when we went to dinner there this past Sunday – a dinner I fought myself about going to – that she had wanted the day to be a special day of relaxing – for me – after having been sick all last week. So, yes, humble pie, and not even eaten nicely, but shoved in my mouth, morsel by morsel. I used this verse to end my journal entry this morning: “Surely He scorns the scornful, but gives grace to the humble” (Proverbs 3:34 NKJV). Thanks for sharing a piece of your pie! Love you!